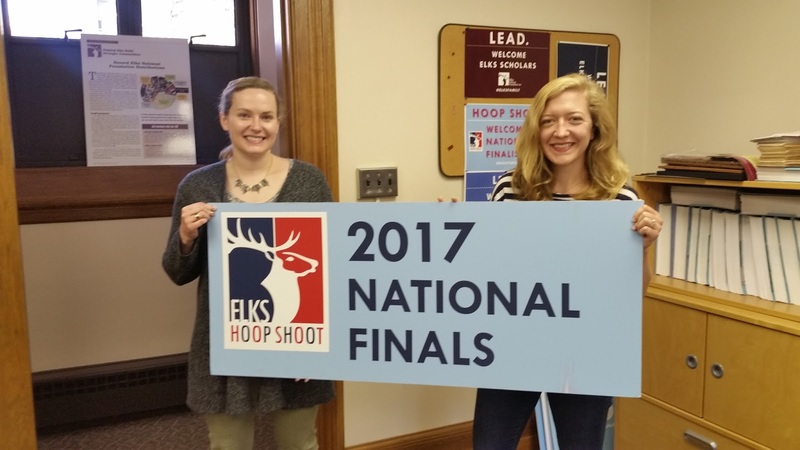 Along with many of the finalists and their families, this year’s Hoop Shoot was my very first Hoop Shoot, and, frankly, I had no clue what to expect. In the months and weeks leading up to the event, I helped with the preparation in a variety of small ways, while others played a much bigger role in the planning and execution of the weekend. I helped choose the bucket list items, stuffed Hoop Shoot badges for attendees, and even helped with preparations for the volunteer dinner. From badges to bucket list items, I didn’t yet understand how it would all come together and what my own Hoop Shoot experience would be like. My first real Hoop Shoot role came on Thursday, as an airport greeter. On that morning I found myself sitting on the train, heading to O’Hare instead of in my car pulling into the Elks Veterans Memorial parking lot. I sidled up to the Airport Express counter in the Terminal One baggage claim and waited expectantly. Finally, the Hoop Shoot finalists and their families began arriving. Every single family, without exception, arrived with wide grins of excitement and nerves. Many had never been to Chicago and were eager to seek advice on the best sites and bites of the city. Although I myself have only been living in Chicago for ten months, it reinvigorated my love of Chicago to share my new city with all these enthusiastic visitors. Several families came in matching Hoop Shoot gear celebrating their finalist, and I was positively taken aback by the visible love and fervent support flowing through each Hoop Shoot family. As the families arrived and were just as quickly whisked downtown via shuttle, the fluorescent lights of Terminal One, my poor shoe choice, and the constant whir of the baggage carousel could not diminish the sense of anticipation that hung in the air for events of the weekend ahead. On Friday, I put on my blue Hoop Shoot polo and headed in the opposite direction towards the Holiday Inn Chicago Mart Plaza. For the next couple of hours, I helped with the trolleys that were driving in loops, offering attendees the opportunity to see some Chicago highlights, including the magnificent Elks Veterans Memorial and Headquarters. Because my position in Donor Services includes a lot of phone and email communication with Elks all over the country, I loved getting to talk to Elks face-to-face for the first time ever. Next, I headed to Water Tower Place, where the much-anticipated Fun Fest would take place at the Chicago Sports Museum. Despite being a Chicago resident, I had never been inside the Chicago Sports Museum. Before the event officially started, I had a blast walking through the museum, playing the games, and seeing the sports memorabilia. Then, I took up my position on the ground floor of the building to direct attendees up the express elevator to the seventh floor. Much like my experience at the airport, it was a thrill to be in the position of welcoming Hoop Shoot attendees. I loved recognizing some of the families from the airport who were now a full day into their Chicago adventure. The excitement was infectious, and I left Water Tower Place even more excited about the events of the ensuing day. Welcoming visitors to Chicago and meeting both Elks and Hoop Shoot families was a fantastic experience. Seeing the children who had worked so hard to make it to the National Finals in Chicago, along with the families who had supported them for months on end was truly inspiring. While I planned on attending the competition on Saturday, I actually ended up getting engaged that day instead, and my now-fiancé had some secret plans for my Saturday that did not include Hoop Shoot. Needless to say, it was a very special weekend in the city of Chicago for many reasons. Just as I’m sure some of the competitors are already back on the court practicing those free throws, I am similarly already looking forward with eagerness to the 2018 Hoop Shoot! The Elks have been developing gritty kids through the Hoop Shoot program for more than 40 years. In 2016-17, the Elks National Foundation allocated $952,760 to fund the program. For videos, news from the court, and more information about the Hoop Shoot, visit elks.org/hoopshoot.